All steel structure, four 200MM focus points, strong grip; high power, high torque drive motor, force machine high speed operation; vacuum adsorption platform, widened gantry, X, Y axis imported helical rack, Z axis imported precision Ball screw. 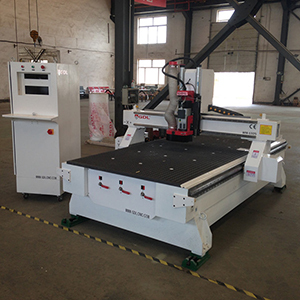 The machine has high precision operation and unique pneumatic protection device, which effectively reduces the loss of Z-axis screw and nut, boosts buffer and prolongs mechanical running time. The whole body is stable and efficient, and it is an armed weapon for long-term and large-scale processing of enterprises.